When I told my family, friends, and colleagues that I was moving to Uganda, they immediately asked if it was safe. Honestly, most of them probably couldn’t find Uganda on a map, but the country’s notorious anti-gay reputation proceeded it and they were worried that I’d be arrested or murdered the second I stepped off of the plane. I made light of their concerns by assuring them that, “I’ll probably feel safer in Uganda as a gay man than I do in most states.” We’d laugh nervously at this statement; no one ever tried to convince me that it wasn’t true. I have been out for over ten years. I’ve lived eight of those years wrapped in the supportive and vibrant LGBT community of Washington, D.C. There I received an LGBT leadership award upon graduation from George Washington University, founded an LGBT affinity group in my office, built a core group of diverse gay men and women that I am proud to call my friends, and fell in love with an incredible man. 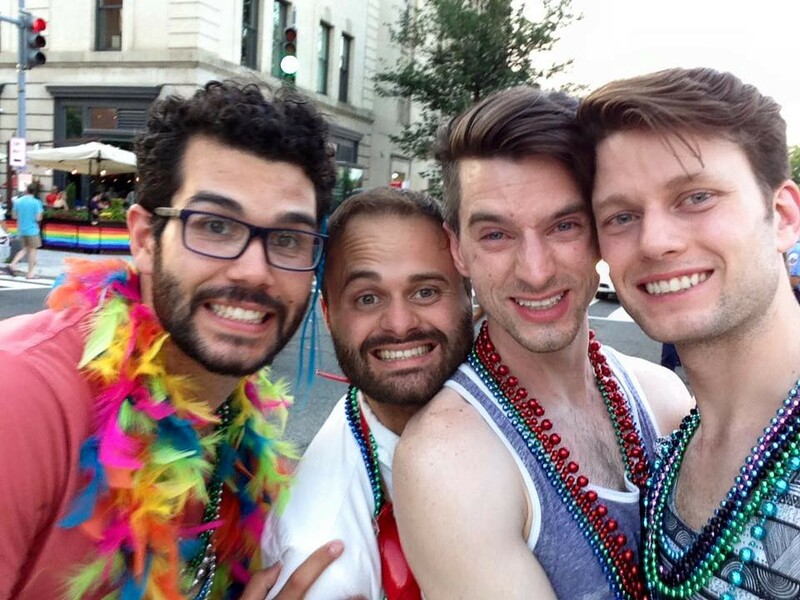 With my boyfriend at the time and my roommates at Capital Pride Parade 2015 in Washington, D.C.
My decision to move to Uganda was motivated by passion and interest in global health, a field that I believe offers real returns on investments in the form of improved and empowered lives. I knew that I would benefit from Global Health Corps’ leadership training and that my experience working for a health NGO abroad would be invaluable for my career. These benefits made moving to Uganda a wise career move, even if it came at a personal cost. I knew that moving to Uganda would mean going back into the closet, and potentially facing discrimination or violence should my colleagues or community become aware of my sexual orientation, but these are also situations that LGBT people living in the United States face. Earlier this year, I called my dad and we were catching up on the latest news in my home state of West Virginia. He told me how the legislature had overturned the governor’s veto on a bill that allows for the concealed carrying of guns and that they were also trying to pass an anti-LGBT bill in the same session. We had another nervous laugh as I pointed out that with one stroke of the pen the legislature was telling the populace that it is justified to treat LGBT people differently and with another empowering them to carry weapons. Last month, I performed in the Laramie Project, a play that examines the consequences of homophobia, alongside 12 Ugandan and foreign actors and actresses in Kampala. We selected this play in order to foster a conversation in Uganda about violence and homophobia in hopes of preventing future tragedies, like when David Kato, a Ugandan LGBT rights activist, was beaten to death in 2011. At the time, I was focused on the idea that Uganda needed to change because the threat of violence seemed to be ever present. I felt lucky that in August, I would be returning to U.S. where I could live openly and freely once again. On June 12, as I woke up to headlines about the mass-shooting at Pulse, an LGBT night club in Orlando, Florida, I couldn’t help but think about all of these nervous laughs and I wonder — am I any safer as a gay man in the United States than as a gay man in Uganda? 49 members of the LGBT community were slaughtered this weekend and 53 others were injured. If a disease as adept at killing as a bullet emerged, we would bang on the doors of Congress and international organizations demanding that vaccines be developed and policies put in place to stop the resulting deaths, yet we refuse to discuss gun-related violence as a public health issue. Approaching gun-related violence as a public health issue would allow us to at least collect data and begin research in this area. The Centers for Disease Control and Prevention (CDC) has been barred from conducting this type of research since the 1990s. The American Medical Association supports overturning the legislation, and in 2013 President Obama issued an Executive Order directing the CDC to begin conducting research again, but no action has been taken. What do we have to lose from conducting this research? We’re already dying. I’m returning the United States in August and it feels a little bittersweet. It’s strange, really. I feel safer in a country that passed the death penalty for homosexual acts two years ago than I do in a country where I’m free to marry the man that I love.